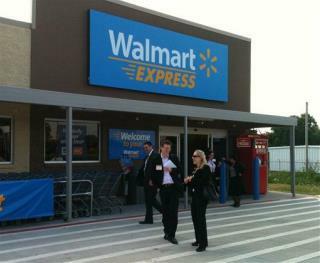 (Newser) – In an attempt to boost struggling finances, Walmart is closing 269 stores—154 of them in the United States. Two-thirds of the US stores to be closed are smaller "Walmart Express" locations, KTLA reports; 12 are Walmart Supercenters and four are Sam's Club stores. Most of the stores being closed are within 10 miles of another Walmart and are not performing well—and Walmart still plans to open 300 new stores globally by 2017. Notice 269 closings! 154 in the U.S.! But opening up 300 Globally! Hmmm... Must be a BUSINESS 101 Decision on Corporate TAXES that R high in the U.S.!! The United States has a top marginal corporate income tax rate in the world at **** 39.1 percent****, !!!!! (THANKS DUMOCRATS who think everyday is APRIL 15th)! Less everywhere else on EARTH!. JAN 20,2017 can't get here soon enough for an END of an ERROR! There ya go ALL!! Unfortunately, this will mean job losses. But what has amazed me is how local municipalities think they can control a private company and force them to pay a certain wage. This sounds like socialism to me. I would not blame any store for moving or closing with this type of environment. These jobs used to be starter jobs. But with the poor economy in the last 7 years they now are whats considered to be a full time job because of our weak economy.